How to install WhatsApp on Android Tablets or Phablets without Play Store? 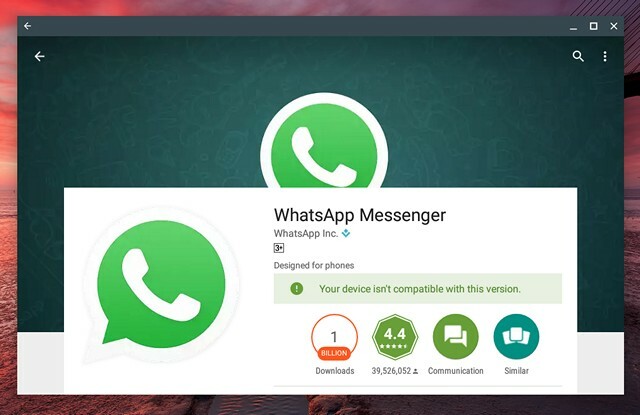 Is your tablet isn’t compatible with WhatsApp? Are you not able to download it from Play Store? Well, today we’ll show you what you’ve to do in this case! If this is what pops up in Play Store then you must be using a device which clearly doesn’t support WhatsApp. It always happen when you’re installing it on Tablets or sometimes even phablets. It’s kind of simple, all you need is an active internet connection and access to the browser in the device you’re installing WhatsApp. You’ll be downloading WhatsApp’s Apk in the device. Now, go to downloads and install that apk. If you’re installing for the first time you might be asked to Allow Unknown Sources from the settings and that’s fine unless you’re installing some other third party untrusted applications. Your WhatsApp is now successfully installed, go to home screen and open it. Now put in your number, and start using it. Hope it work for you guys! If not, you’re free to contact me and drop any question in the comment down below so I can get in touch with you and fix your problem up. Thanks for visiting my blog, please subscribe to get latest content from us time to time. We’re looking for growing our blog and also getting some writers for our blog. If you are the one, please drop us an email.